The drumstick is a fairly common vegetable grown all over India. It is valued mainly for the tender pod. It is antibacterial and a wonderful cleanser. The drumstick tree is perennial, erect, slender, medium sized with many arching branches. It is mostly grown as a backyard tree in most of the South Indian homes. It has drumstick like fruits, small white flowers and small and round leaves which are cooked and eaten as vegetable. Add the masala powder, potato and a pinch of salt, mix and cook for 2 minutes, then add tomato puree, drumsticks cook for another 30sec. Add enough water just to cover everything. Once the pressure is out, open and boil till you get the required consistency for the gravy. 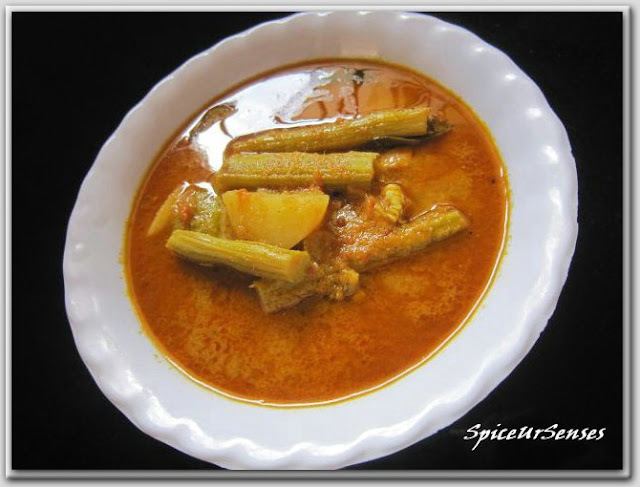 Garnish with coriander leaves and serve with Rice/Phulka /Roti/chapati and papad. first time here. You have an awesome space. I want some of this saucy gravy! Looks yummy! I am loving that color of the gravy, too mouth watering. Gravy looks so spicy and yummy!! 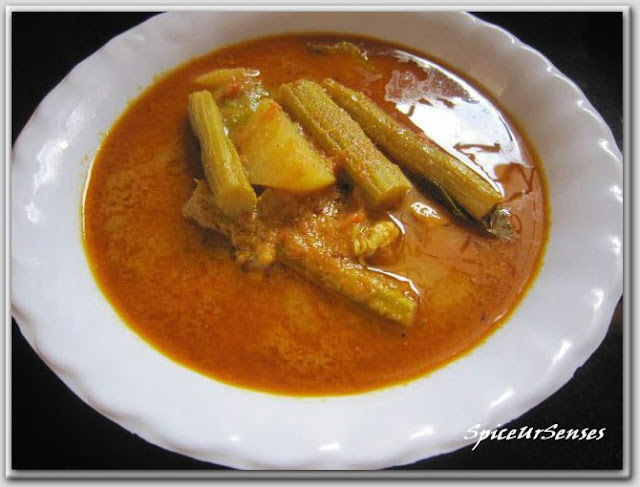 Such a droolworthy kurma, beatiful combo..
Thats a nice combo rumana..Looks good.. Sounds healthy and delicious, drumstick is my favorite too..
Love this combo... Looks great too..
Yumm combo..Wish I could get some fresh drumsticks here.. Delicious drumsticks, always my fav. I liked your blog very much. I appreciate for your wonderful presentation. Kurma looks delicious and tempting. Love this spicy and tasty gravy..Nice recipe, Rumana..
Looks Delicious.My daughter name is also Rumaanah.